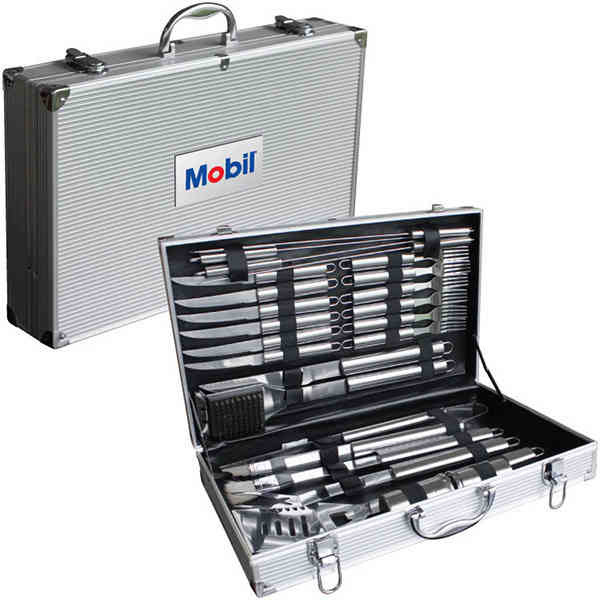 24 pc BBQ tool set in an aluminum case. Features a spatula, fork, tongs, knife, basting brush, grill brush, 6 steak knives, 6 dinner forks, 4 skewers, and salt and pepper shakers. Size: 12" h x 19" w x 3 1/4" d.
Size: 12 " x 19 " x 3.25 "
Imprint Size:2 1/2" x 4 1/2"
Ship Weight:40 lbs, 40 lbs per carton of 4 pieces.